Neil Young is churning out records with a pace that makes it hard for a honest blogger like me to keep up. Being a near life-long fan, gliding on the highs and lows of Young's career, I am at a minimum always interested to listen and take it from there. 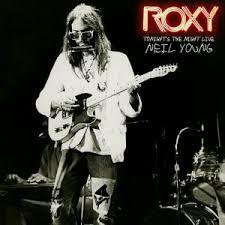 Roxy: Tonight's The Night Live is an album in the series of legendary shows Neil Young is releasing since this decade of which some albums were nothing but sensational additions to his huge oeuvre. The record is culled from the total of six sets the band, named the Santa Monica Flyers for the occasion, played on 20, 21 and 22 September 1973, celebrating the opening of the Roxy on Sunset Strip in Los Angeles. The rhythm section of Crazy Horse, guitarist/keyboardist Nils Lofgren (now with Bruce Springsteen) and long time friend and collaborator Ben Keith on pedal steel and slide guitar. My truly first Neil Young (and Crazy Horse) album was 'Zuma' (1975), with 'American Stars 'N' Bars' (1977) the first one I bought. So 'Tonight's The Night' (1973) is an album I had to backpaddle to somewhere around 1980, when I earned enough to buy records regularly. It never was one of my favourites. Too raw, too unleashed emotions. I never really liked it. So I was not standing in the frontline when this album was released. And was I wrong. Just starting with the title song. 'Tonight's The Night' gets a bluesy treatment, making it such a strong song. It is elevated straight up to my list of favourite Neil Young songs. Why?, you may ask. What is the difference? That answer is not hard to find. It is in the reticence Neil Young and band allow for here. There are all sorts of holes in the music putting tension into the song, where the original is filled with pain and anguish. It does it so much good. A surprise is the musical joke that follows, 'Roll Out The Barrel'. Now here in The Netherlands we know this melody as 'Rosamunde'. I suppose a German song by origin. So were are we on this? Wikipedia, always helpful, provides the answer. Both songs are in the basis composed by Jaromir Vejvoda, a Czech polka music composer, who is credited. Problem solved. The selected set of songs that follows, shows the versatility of Neil Young. A country ballad comes by, a rocking song, a groovy rocking ballad incorporating some great blues elements into the whole, an acoustic dreamy ballad, that would have been great on a new CSN&Y album, never released. In some of the songs Young is already hinting to the sound on his (then) next album, and my all-time favourite, 'On The Beach' (1974). 'Walk On' is even one of the songs performed. There is one common denominator between all these songs: The level of playing seems extremely relaxed and of a consistent high level. Band and leader are totally at home in the songs they play and on the stage together. The playing of 'Albuquerque' may sound sloppy, the foundation is totally in place, with a highlight for ben Keith's pedal steel. Neil Young seems less concentrated, especially in the harmonies. The strength of the song remains totally in place. Neil Young is still going strong. Playing and recording with Promise of the Real. This dive into history allowing us to hear parts of his shows in late September 45 years ago, is the kind of musical present I do not mind receiving every once in a while. When presents are this good, I promise to refrain from looking the Crazy Horse in the mouth and just enjoy myself.